Loose gravel on mud, an uphill road through woods filled with new ferns, the dripping canopy, a sky trying to clear. Late afternoon light on the mountains, standing stones, gardens where leaves of all shapes and colors within the general category of green form a sculpture in low relief, ankle- to knee-height above the dark earth. A thin grey snake slithers under a paving stone. Golden globes of trollius nod near blue forget-me-nots, violet violets. Under thorny rose canes, earnest purple johnny-jump-up faces; iris of deepest indigo studded with raindrop pearls; pure white starflowers, crisp as starched linen. A bullfrog jumps ahead of my foot into the pond. Leaning over the water I see tadpoles, those macroscopic reminders of our own beginnings, in every size from mere black dots to near-frog giants, tails swishing, heads bigger than my thumb, legs starting to sprout. First we swim, then crawl, then hop...but not this one, the ghostly white carcass of a dead bullfrog lying on the bottom of the pond, starting to decompose, near him a large gelatinous mass of eggs. Healthy frogs peer from quick bright eyes above the surface, hop along the mossy bank and into the reeds. Lupine, its budded flower stalks beginning to rise toward the sun, carpets the damp semicircle at the end of the pond, and beyond, over the bank, tall choke-cherries, hawthorns with tight clusters of white buds, lush growth of ostrich ferns, and cattails rise like torches in the swampy gully before the land moves up again, covered with mixed forest that gives way in turn to conifers, more conifers, and blue mountains. I head back to the house where J. sits on the porch talking to our friend K.; the host, G., is in the kitchen from which the smell of roasting lamb and herbs is wafting. Waiting for the other guests, we all listen for car sounds - the new gravel on the road is deep and slippery after the day's rain - but soon we hear their voices; they too have made it up the long winding driveway and the ebullient greetings soon change to hushed "ohh! "s as they catch their first glimpses of the garden, the pond, the standing stones covered with lichens, the mountains from which the storm clouds are lifting. Glasses of wine, the surprise of late-afternoon sun on our faces, black flies cheerfully waved away from pulse-points, ankles and ears. Stories of our childhoods in Vermont, rural New York, Detroit, Pennsylvania, Los Angeles via Hungary -- all of us American originally but one, who grew near here, where his family gathered and preserved enough fiddleheads to eat all year, ate honey and maple syrup rather than any other sugars, spent the winter caning chairs with sea-grass. We never thought it was an unusual life, he said, it was just how you lived here, that was Quebec. Before dinner, I acquiesce to the quiet urge I've had since arriving, ask a quick permission, and slip away to the separate building that is G.'s meditation and yoga space. I open the door and step inside, into the silence I knew would be here, the vibrating fullness and emptiness of a place that has become sacred. There are folded blankets and cushions on the edge of the large rug with its subdued pattern of olive and rust, and I notice G.'s meditation shawl of plain cotton that he brought back from the ashram in France. From a different pile I take a pink blanket and a white cotton cushion and arrange them in front of the rough wooden slab, on two sawn tree stumps, that holds a white perpetual candle where a flame flickers in a pool of paraffin. There are some books in a corner; some natural objects, a rock or two - which make me smile; my own shrines always contain rocks – other objects from several religious traditions; incense burners; more candles, unlit. In back of me, a cold wood stove and a rocking chair. And on the wall above the wooden plank, a photograph I first saw last year, of rows of meditating people wrapped in white cotton shawls or cloaks in a large candlelit room. He's placed it so that sitting here, you feel like you are in the back of the same room, looking forward, part of a community. The minutes pass; going deeper. I know I can't stay long. Wood thrushes sound their cascade of notes in the woods, and finally I turn my head and look out. The big window that forms half the wall to my right frames a view of the green forest, punctuated by wet black tree trunks and two narrow paper birches. In the soft last light of the day it is indescribably beautiful. Suddenly thoughts of my mother and my mentor, Herm, gone for many years now, rush into my head. I reach up instinctively and grasp the old pendant hanging around my neck that was my mother's; it's gold with a clear green faceted stone crowned by finely wrought, small gold leaves. Tears spring to my eyes, and then a feeling of immense gratitude. I shut my eyes, breathe deeply, open them again. It's then that I notice the fern just outside the window. 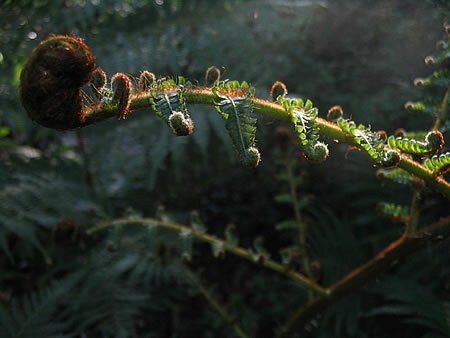 It's an interrupted fern, one of Herm's favorites - he used to jokingly call them Fernus interruptus - and perfect in its newness, the fruiting bodies on the stem not yet dried, the fronds above and below them light delicate green. I search the woods nearby but it's the only one I can see. We look at each other. So this is life, isn't it, I say to myself eventually. An interruption, aware of itself, named... with a task to ripen, dry, break open and scatter... while meanwhile roots reach down and fronds unfurl above and below, unconsciously, continually. I finish my meditation, fold the blanket again and put it back, open the door and step out into the world.